Popular histories tend to explain innovation in terms of heroic entrepreneurs – like Bill Gates, Steve Jobs, James Dyson and the like – who triumph over adversity. Although there is a grain of truth in these accounts, they are also wide of the mark because they convey a totally misleading picture of the innovation process. Innovation is slowly but surely being recognised for what it is – a collective social endeavour in which smart teams trump heroic individuals. Smart teamwork occurs between a firm’s workers and managers, through corporate supply chains and in regional innovation ecosystems in which universities are key players. Walter Isaacson captured the reality in his recent book, The Innovators, in which he demonstrates that “collaborative creativity” underpins successful innovation. Collaboration is necessary because no organisation can hope to absorb all the knowledge needed to create new technologies, products or services. Successful collaboration requires trust, an intangible asset that has a value but no price. Trust has to be acquired by discharging commitments to partners, and that takes time, patience and understanding. In short, high trust relationships are invaluable. They save time and money, and they make for fast learning, because high trust partners share information and knowledge more readily. Collaborative creativity and social trust may seem airy notions, but they are central to the thinking that spawned Smart Specialisation, the EU’s new regional innovation policy, which champions innovation as a collective social endeavour. All regions that hope to use European Structural Funds are obliged to have a Smart Specialisation strategy and Wales is no exception. Smart Specialisation calls for universities, the business community and civil society organisations to have parity with regional governments in the design and delivery of innovation projects. How is Smart Specialisation faring in Wales? Although it is still too early to tell, the question is crucial because universities have recently launched a wave of innovation campuses to overcome the traditional problem of “science silos”, where research results remained trapped in university labs and never got translated into innovative products and services. One of the first campus projects to be funded by the current Structural Funds programme in Wales was the £35 million Aberystwyth University Innovation and Diffusion Campus at Gogerddan, where the EU contribution was £20m. Bangor University has invested around £45 million in Pontio, its new Arts and Innovation Centre; while Swansea University is reportedly investing £450 million in its Bay Campus to launch collaborations with prestigious firms like Rolls Royce, Tata and BP. Under the banner of the Cardiff Innovation System, Cardiff University has launched the most ambitious research and innovation strategy in its history. Following the successful launch of the Cardiff University Brain Research Imaging Centre (CUBRIC), additional innovation projects are underway, including: a new Innovation Centre to promote collaborative creativity in the spirit of Smart Specialisation. The Translational Research Facility will house a new generation of university research institutes: Cardiff Catalysis Institute, developing new catalytic processes with industry and promoting the use of catalysis as a sustainable 21st century technology; and the Institute for Compound Semiconductors, which aims to position Cardiff as the European leader in compound semiconductors, providing cutting-edge facilities that help researchers and industry work together. 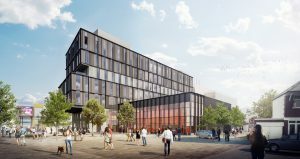 SPARK, the world’s first social science park, will see researchers co-locate with public, private and third sector partners to explore technological and social innovation. At a total investment of £300 million, the Cardiff Innovation System is a resource for Wales and beyond, serving as magnet for international talent and R&D investments like Horizon 2020 and its successor, Horizon Europe. The campus aims to build bridges between schools and disciplines within the university, providing spaces where researchers routinely interact with and connect to the worlds of government, business and civil society. Collaborative creativity could well serve as its motto. There is no better example of collaborative creativity in Wales than the Welsh Wound Innovation Centre (WWIC), the first national wound healing centre in the world that had its origins in the Wound Healing Research Unit in Cardiff University led by Professor Keith Harding. Created in 2014 to provide leadership for wound prevention and healing in Wales, the WWIC has proved its value to Wales and the NHS not merely through its clinical contributions, but also through inward investment that has already created more than 80 new jobs. As the pathfinder for clinical innovation in Wales, the WWIC is the only body that connects the NHS, academic researchers in Cardiff and Swansea Universities, and commercial organisations. Taken together almost £1 billion is being invested in Welsh innovation campuses. If this sum was being invested by a foreign inward investor, the BBC and others would be over it like a rash. Perhaps it’s time for the media to wake up and realise that the university campus, far from being an ivory tower, is heavily engaged in grappling with social as well as technological innovation. Kevin Morgan is Professor of Governance and Development in the School of Geography and Planning at Cardiff University, where he is the Dean of Engagement.